I want to start first by saying that this is a beautiful book. The actual physical artifice of the thing is just lovely, all the way down to the paper used for the front material. I know that is strange way to start a review, but I was really taken with how attractive this book is. In the world if digital media and online publishing it is great to see a carefully made book. Now the reason we are all here- the actually words inside the book! 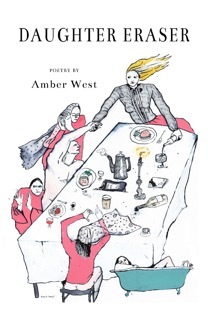 Amber West, a self described feminist writer, has brought all things female front and center in this collection of poems. From discussing the struggle of parenthood, conflicts with family, and the infinite ways that men can be letdowns, her poems are thoughtful and unflinching. Many of these themes can be seen in the poem “Zebediah Loyd Skiles West,” in particular when the speaker says “Mom trying to push you past the failed IUD/Our father bicycling from the bar/to an ex-friend’s house.” It is encouraging to see a real woman’s situation, and a frank mention of birth control, without it pandering or cloaked in word play. These types of issues are real and relatable and told in a way that readers just plain get. The stand outs of the collection are “Tiffany” and the final poem, “Banana Slugs.” Both use a strong voice to mourn- mourn a lost friendship, being pushed aside, even survivor’s guilt. The situations in each are different, but they are also heartbreakingly universal with emotion that is raw and personal. You don’t have to a woman to love these poems- they are just plain good- but coming at them from a woman’s perspective adds just that much more depth. This, and a glass of pinot, makes for a worthy read.